One way around the whole controversy is to make a variation on the traditional dish. Everyone will be so suprised that you put nutmeg in that they’ll be quiet about your preferred mashing tool. Or at least, we can hope. First, the onions. Peel and dice them, then heat a skillet with one tablespoon of butter plus the canola oil over medium heat. Add a pinch of salt and the onions and cook until they soften, then turn the heat down to medium-low. The slower you can stand to cook these, the sweeter they will be, and as long as the butter is bubbling and popping, they’re cooking. You want to cook them to a medium brown color, which can take anywhere from 10 minutes on medium to close to an hour on a lower heat. All of the ways produce onions mellow enough to use, but the sweetness of really caramelizing them slowly is worth the wait. When the onions are getting close to done, peel the potatoes and chop them into roughly one-inch cubes. It’s best to do this one potato at a time, peeling and chopping and then putting the pieces in a bowl of cold water to prevent discoloration. 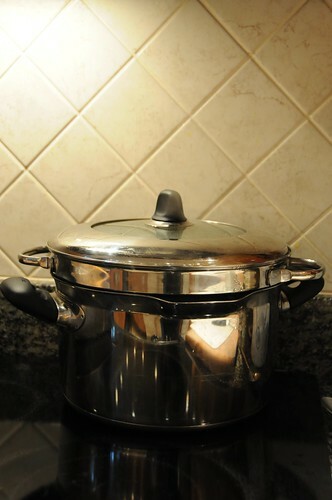 Set up a pot with a steamer basket big enough to hold your potatoes. Add enough water to come close to the bottom of the steamer, and put it on to boil. Meanwhile, rinse the potatoes in a couple of changes of cold water; this helps remove excess starch. You can hold the potatoes in a bowl of very cold water (I sometimes even add ice) until the water boils. Once it does, put the potatoes into the steamer basket and set a timer for ten minutes. When the onions are caramelized, stir in the brandy and cook for a couple of minutes, stirring constantly, until it no longer smells like evaporating alcohol. Stir in the nutmeg and remove from the heat. When your timer goes off, carefully pull the steamer out of the pot and rinse the potatoes under cold running water (more starch removal! ), then put them back in to steam until they’re tender all the way through. This will take 10-15 more minutes, depending on the exact size of your chunks. 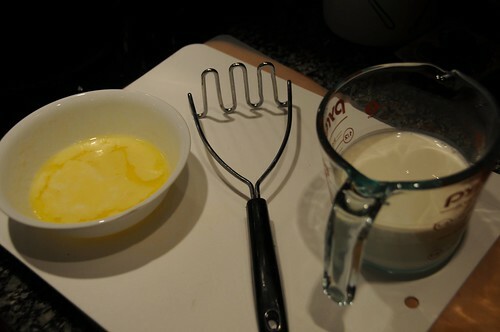 While that’s happening, warm up the half-and-half and melt the remaining five tablespoons of butter. When the potatoes are done, you need to start squishing them. The easiest way to do this is with a potato ricer, which is like a garlic press on steroids, but of course, mashing with a potato masher or even forks will do the job. Or you can fake a ricer by pushing the potatoes through a medium-mesh sieve with the back of a spoon. Once they’re mostly squished, add the melted butter. (You’re going to want to mix gently if you used a ricer; if you’re mashing by hand, keep at it.) Add the half-and-half a bit at a time, until you’ve attained nearly your preferred level of squishiness. Then mix in the onions, which will make them just a bit squishier, salt and pepper to taste, and serve immediately. *I am a huge fan of Yukon Gold, which is a medium-starch variety, for mashing. 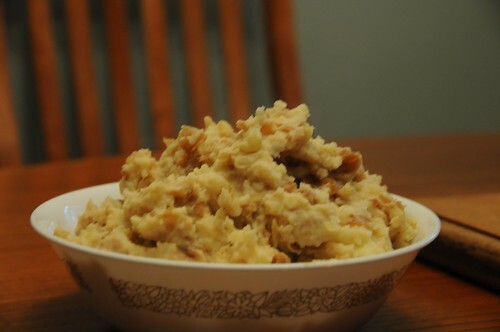 If you use a starchier potato like russets, you may need more half-and-half. Stay away from waxy potatoes (like the little red-skinned ones) for mashing; they’re better for salads. **You can caramelize extra onions and freeze them, and then you’ll have them ready any time you want them! When you defrost, they’ll be pretty soft and mushy, but that’s the nature of caramelized onions anyway, so it’s fine for nearly all uses. Just take your extras out before you add the brandy!